Studio One 3 won't launch on Windows 7 SP1, gives an error that a Platform update is needed, how do I fix this? I ran into this error when I went to run Studio One 3 on my Windows 7 x64 SP1 system. This means that your system does not have all the latest updates from Microsoft installed. To remedy this open up your control panel by clicking on the Windows Logo and click where it say "Control Panel"
then click on the button that says Install Updates. (note the size of updates you need may vary from the number shown in the example). Windows will need to be restarted when updates have completed. After the system restart, go back to the Windows Update Screen to see if more updates are needed. Repeat the update process until you see this screen. Now you can go back and launch Studio One 3 successfully. Note if you're having problems getting Windows update to work or you get further errors that Windows Update is not functioning, please go back to where you purchased the computer for assistance, contact Microsoft or consider posting a question to the Community Forums for suggestions on how to resolve the update issue on your system. Note: This appears to be unique to only Windows 7. We have not seen this error on Windows 8 or on the Technical Preview releases of Windows 10. 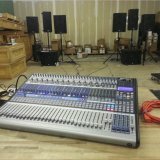 How do i fix my Studio One 3 OEM update problem (with vsti plugins)? Latest update Studio One Pro 3.1.1.35857 How do I stop the constant packaging every couple minutes while I'm working?? I have Studio One 3.1 or whatever and i downloaded the update and installed it but it hasnt applied? What do i do? Why do I get an Invalid username/password or Status 200 error when I launch Studio One 3? In Studio One 3 it won't let me add a sample to Sample One, How can I fix this? On Studio one 4 I don't have a quantize section in my tool bar why is this how do I fix this ??? Why is no audio coming from the Studio 192 when working at 96kHz on Windows 7 SP1 x64? AudioBox iTwo - Windows 7 backwards compatibility workaround, please? window 7 have been updated but studio one professional won't launch. help please.